This brand new house and cabina have just been completed. Located in the outskirts of Ojochal, this corner lot has the two living structures, a large pool, and more room to build. The first house is a 1000 ft2 house with a large patio overlooking the pool (2 BR/1 BA). Below and beside the house is a small one-bedroom cabina with bathroom and outdoor kitchen. In front of the houses is another building site, and behind them is a beautiful ceibo tree and more usable land. This property is located only 5 minutes away from Ojochal center, where you can find a supermarket, shops, and many great restaurants. 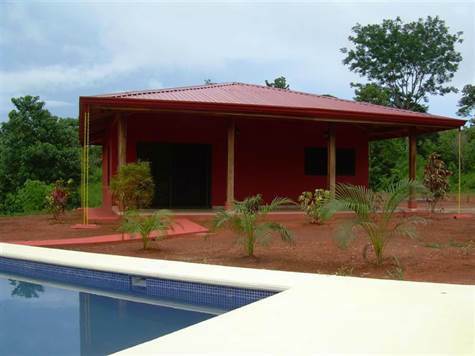 Ojochal is a developed international community just across the highway from beautiful Playa Tortuga, and only 30 minutes from Dominical and the airport at Palmar Norte. Its location makes this a great property to use as a rental or vacation home.